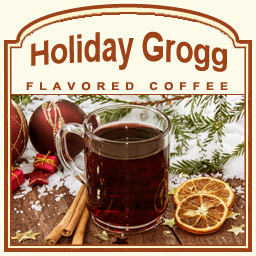 The Holiday Grogg flavored coffee is a spectacular creation of the flavors of cinnamon spice, warm roasted pecans, combined with a smidgeon of Scottish brandy. With an aroma that will make your taste buds want more and more, Holiday Grogg is the perfect way to spread holiday cheer with its 100% authentic Arabica bean flavored indulgence. Let this 2-calorie cup of coffee sweep you off your feet on a Scottish vacation or take you back to nostalgic holiday memories. You won�t be able to resist! Roasted and shipped on the same day, this Holiday Grogg flavored coffee will be packaged in a heat-sealed valve bag to ensure its cinnamon, pecan, and Scottish brandy flavoring is properly preserved. For a full-flavored treat, try the Holiday Grogg today � it'll be the perfect addition to your flavored coffee collection!